Are you hosting a baby shower and looking for cute table centerpieces? Or do you want to impress the soon-to-be new mom with a really special gift? Stork bundles are cute gifts for a baby shower and they make great table decorations. You can tie balloons to it and use it as cute centerpiece for the tables. The mother-to-be will soon be using those diapers. 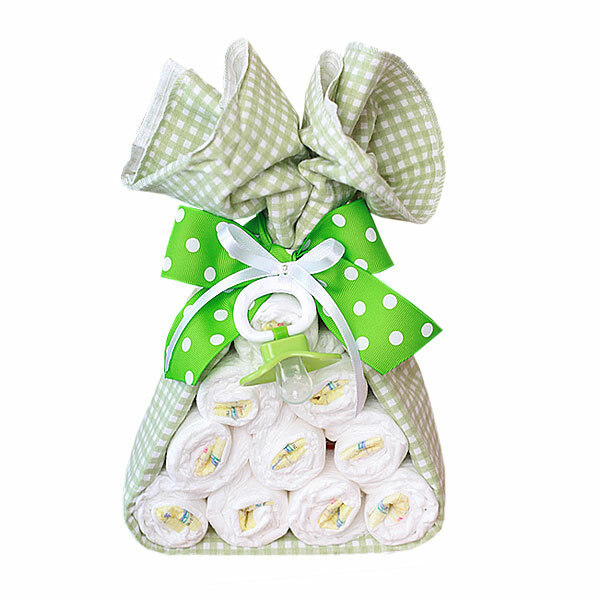 Each stork bundle comes with 10 Pampers Swaddlers Diapers size 1 (7-14 lbs. ); one flannel receiving blanket 100% cotton (patterns may vary); one pacifier. All diapers and baby items are usable. Stork bundles can be made with custom color ribbons and blankets. Just send us a message and we will be happy to give you a quote for a custom order. This very practical gift will be wrapped in clear cellophane and tied at the top with curly bow. All our gifts made of highest quality ingredients with greatest care and love. Everything included is ready to use and easy to disassemble.